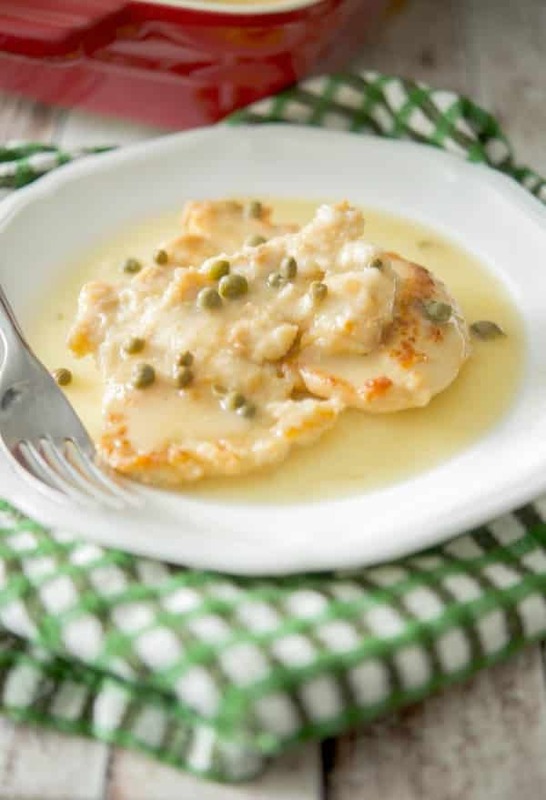 Chicken Piccata made with boneless, chicken breasts that have been lightly floured and pan sautéed; then topped with a white wine lemon caper sauce. 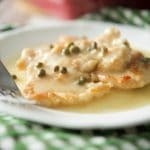 I first posted this recipe for Chicken Piccata back in 2012 and to tell you the truth, I haven’t made it since. 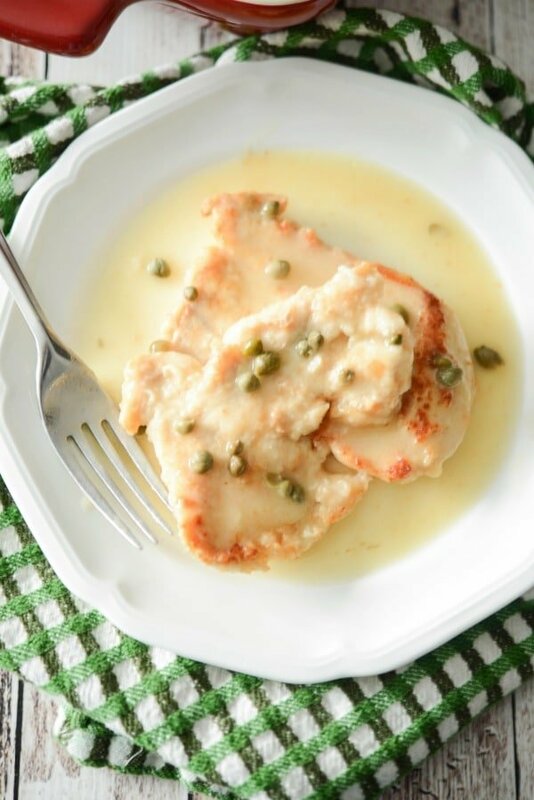 Don’t get me wrong, I love this dish, but my family prefers my Chicken Francaise or Chicken with Lemon Butter Sauce recipe better. I think it has something to do with the capers. You either love ’em or hate ’em. If you’ve ever asked yourself what the difference is between Piccata vs. Francaise; it’s actually not too much really. They both can be made with chicken, veal or fish and both consist of a lemon butter sauce. 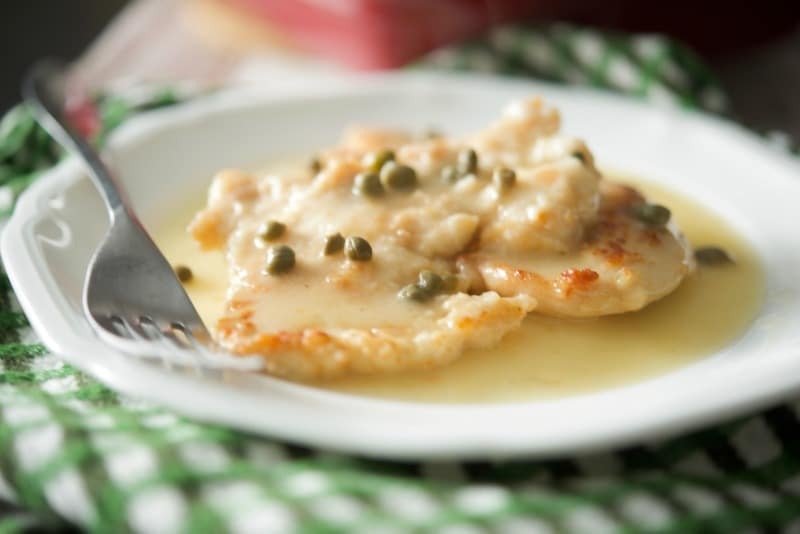 The difference is that while Francaise dips the meat into flour and an egg wash before pan frying; Piccata only dips the meat into flour and also adds capers to it’s lemon butter sauce. Capers grow in the Mediterranean on a perennial plant that bears round leaves with white to pinkish-white flowers. I was actually shocked to see that they grow right out of the rocks when we visited Santorini, Greece and not in the ground. After the caper buds are picked, they are dried in the sun then pickled in vinegar, brine or salt. They have a tangy, lemony flavor similar to green olives and add another nuance to your dish. 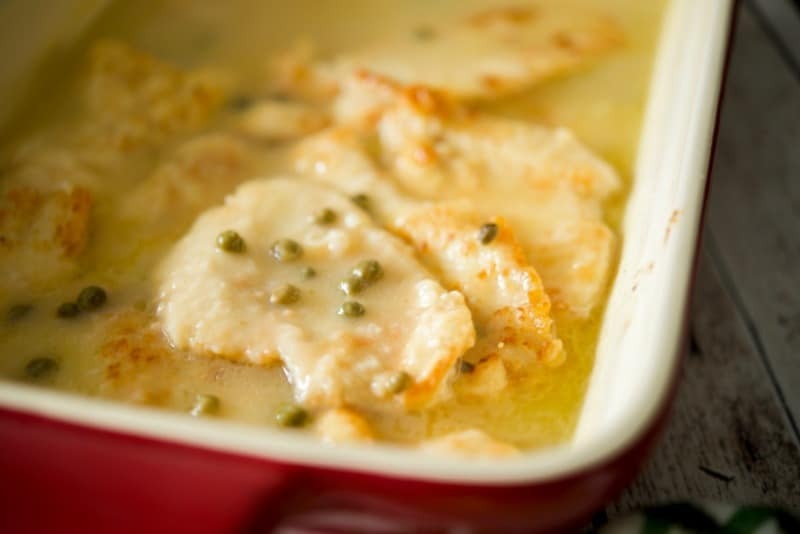 Making Chicken Piccata is pretty simple and can be made ahead of time; then refrigerated or frozen until ready to bake. For this recipe you’ll need boneless, thin sliced chicken breasts, flour, butter, oil, lemon, capers, white wine and chicken broth. First, I like to make the sauce so that while it’s thickening, I can get the chicken ready. Start by melting some butter in a medium saucepan; then whisk in flour to make a roux. Add lemon juice, white wine, chicken broth and the capers; then stir until the sauce starts to thicken (about 5-8 minutes). Remove from the heat and set aside. Next, it’s time for the chicken. Melt some butter and oil (I use a light oil like Canola) in a large frying pan; then dredge your chicken in flour. Fry the pieces of chicken until they are cooked through (about 5 minutes depending on thickness); then place the chicken in an oven proof dish until all of the pieces are cooked. You can overlap the pieces a little bit, but don’t stack them on top of each other so make sure your dish is large enough. (I used a 13″ x 9″ casserole dish). Pour the sauce over the chicken, then place in a preheated 350°F oven for about 30 minutes. This will make sure all of your chicken is cooked through and the sauce permeates the flavor into the chicken. We like to serve ours with rice so you can put the extra sauce on top, but egg noodles would be good too. And don’t forget your vegetables!). 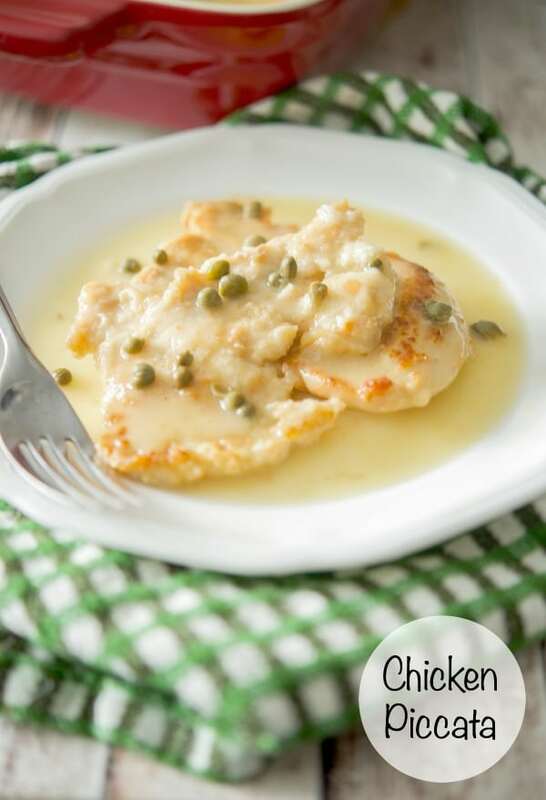 I forgot how delicious this recipe for Chicken Piccata is and was so glad I made it again. This recipe makes enough to serve 8 people, but it also freezes well to serve for another meal. ~Enjoy! Heat the butter and oil in a large frying pan; then dredge your chicken in flour. Fry the pieces of chicken until they are cooked through (about 5 minutes depending on thickness); then place the chicken in an oven proof dish until all of the pieces are cooked. (You can overlap the pieces a little bit, but don't stack them on top of each other so make sure your dish is large enough. I used a 13" x 9" casserole dish). Melt the butter in a medium saucepan; then whisk in flour to make a roux. Add lemon juice, white wine, chicken broth and the capers; then stir until the sauce starts to thicken (about 5-8 minutes). Season with salt and pepper to your liking; then remove from the heat and set aside. *This recipe can be made the night before; then refrigerated until it's ready to go into the oven the next day. It can also be frozen for up to 3 months before defrosting and cooking as well. This looks delicious! 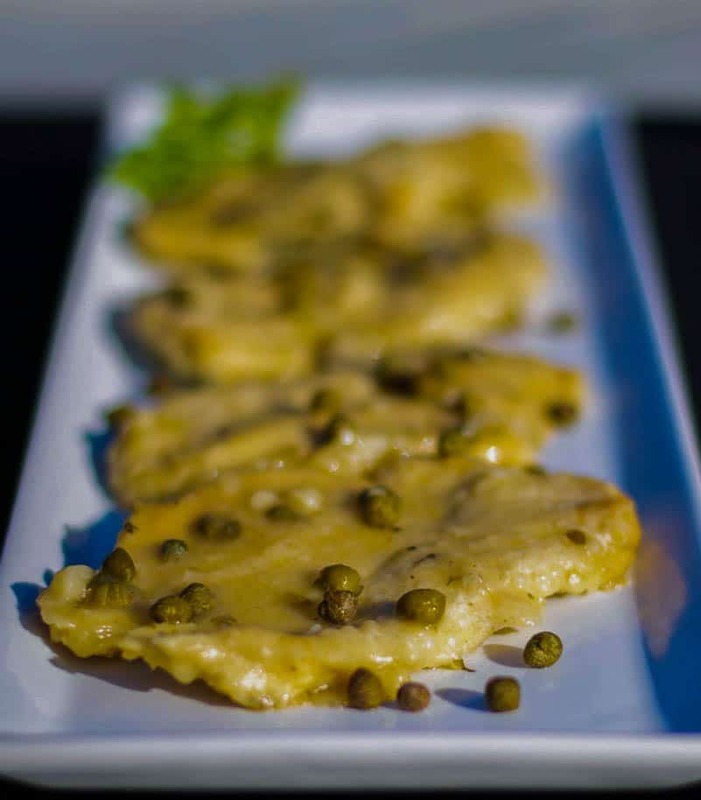 I love piccata and your recipe sounds great! Wow this looks delicious. I haven’t had piccata in forever, but I can easily make this at home too. Thanks for sharing on Newlyweds Recipe linky, please don’t’ forget to link back so others can join too. Thanks Jenna and Sorry, I always forget that part! Just added it now. Happy Easter! I love this dish and I can’t believe I’ve never made it, so excited to try it. Please share this on my foodie friday linky today. Sorry Diane, I just saw this today. I was off line this weekend. Thanks for the invite! I am hosting a party for 65 people the end of December. If I make this dish a few days ahead of time and freeze it, should I pour the sauce on top of it before it is frozen or freeze the sauce separately? Also, if I freeze it, at what time and how long do I bake it the evening of the party? Have you frozen this recipe before/turns out ok? thanks so much for your help. I’ve never frozen this recipe; however, I have frozen Chicken Francaise which is similar and it works fine. I make the whole recipe with the sauce and freeze in half trays. I usually take it out of the freezer 1-2 days before I’m ready to cook so it’s defrosted so I’m not sure how much longer it would take cooking from the frozen state. 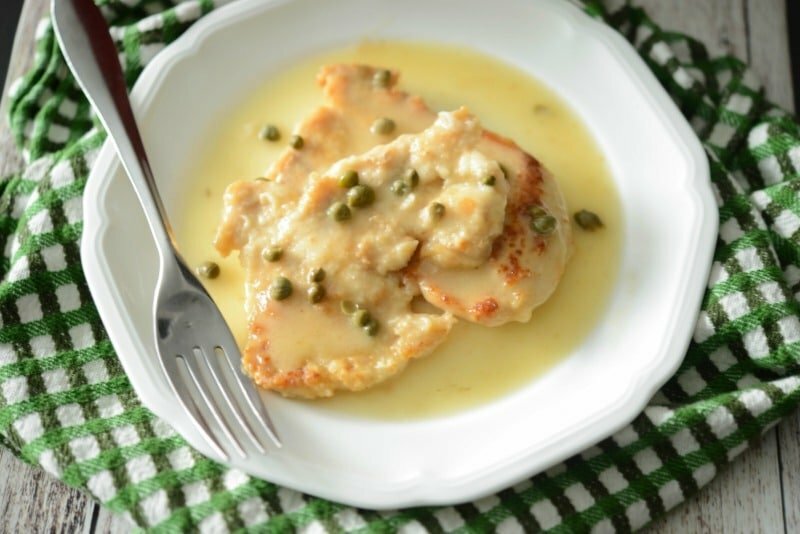 A PICCATA that can be made ahead -amazing. Thank you for the recipe and my neighbors, for whom I made the entree loved it, too. When one is asked for the recipe that is the epitome of a compliment. All of the comments printed are from folks who hadn’t made the dish yet. I have and it was yummy-just had to do some unexpected tweaks at different steps. The biggest problem was the sauce wouldn’t thicken! I am not on FACEBOOK or any other social vehicles, but I do receive your email. Did you by chance make any additions or alterations, publish them elsewhere and not online? Brava- love your recipes, but I need your experience assistance with this beauty. Hi Laurel, I’m so glad you and your guests enjoyed the recipe! I didn’t make any changes to the recipe so I’m not sure why the sauce didn’t thicken properly. Did you adjust the serving sizes and make more? If so, that might have been the reason. If a sauce doesn’t thicken properly, you can always combine flour and cold water, mix them together to form a thick paste-like consistency; then gradually add it to your sauce and whisk to thicken it up some more. Or you can do the same with equal parts of cornstarch and cold water; however, if you thicken with cornstarch, it doesn’t freeze well and the sauce will congeal so this will only work if you are serving it at the same time and not reheating or freezing any leftovers.